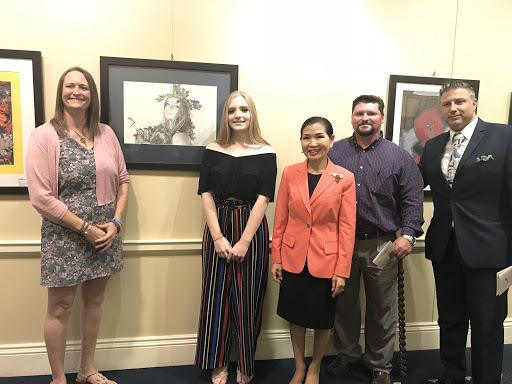 Eleventh grade Queen Anne’s County High School student Jenna Hauser took first place in First Lady of Maryland Yumi Hogan’s 4th annual statewide exhibition at the prestigious House of Delegates. The exhibit is for “the best of the best” artists from all 24 counties in Maryland, K-12. Hauser won the only award presented to a high school student in the entire State of Maryland with her self-portrait graphite drawing. Jenna wasn’t the only award-winner representing Queen Anne’s County Public Schools. 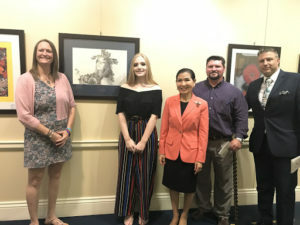 Ninth graders Casey Gessert and Kevin Likowski both had an outstanding works of art placed in prestigious positions in Annapolis; Gessert’s work was featured in the First Lady’s House of Delegates Show where she met First Lady Yumi Hogan and Maryland State Superintendent Dr. Karen Salmon. Likowski had a prized piece placed in the Treasury Building Exhibition. “It’s been an absolute pleasure to teach Jenna for the last two years and it was very exciting to be a part of her artistic growth during the development of her self-portrait. She’s an excellent student, a wonderful person, and an outstanding artist. This award is such a great accomplishment and I am so very proud of her!” – Tim Goodger, Art Teacher, QACHS. “Jenna inspires me and she is an incredible ambassador of the arts for our county. I am so excited for her and for our program because I believe this will spark excitement for other art students.” – Stephanie Zeiler, Lead Art Teacher, QACHS.